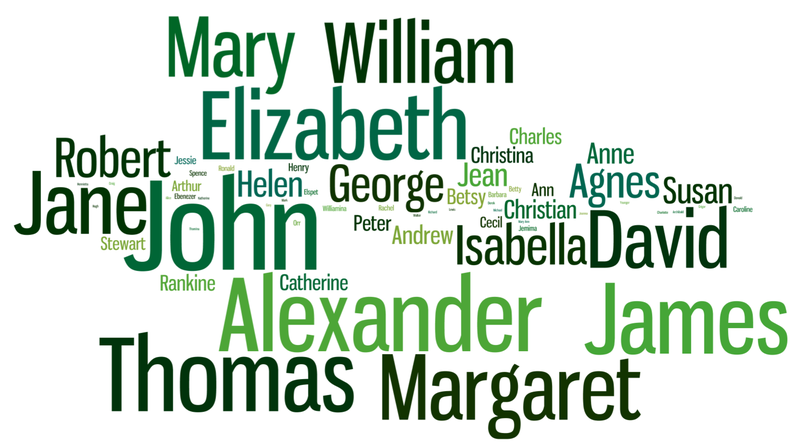 First names word cloud: this time only direct ancestors. Created with Wordle. Having collected all the data on family names, I’m keen create some useful inforgraphics. Looks like Thomas and Alexander are the clear favourites. This time I’ve only included the first names of my direct ancestors and family members. 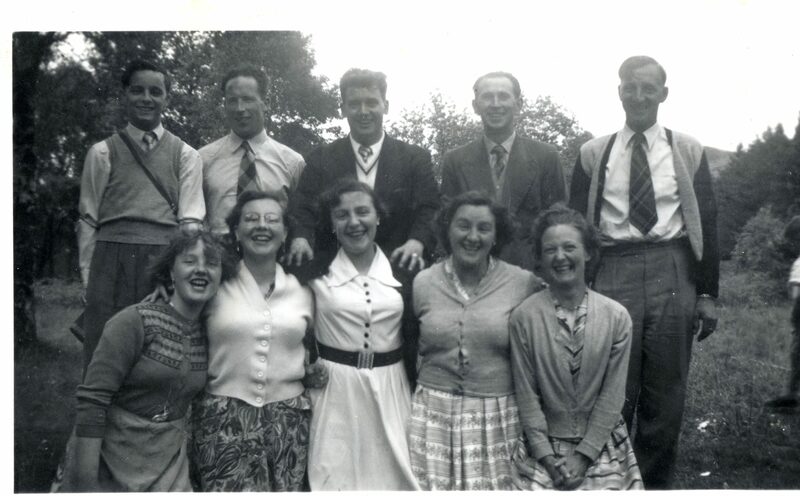 The Ramsay sisters – and brother, with their partners. Marriage doesn’t necessarily introduce new names into the family; my mum and her siblings with their partners. Back row left-right: James, William, Ron, David, David. Front row left-right: Sandra, Catherine, Elizabeth, Mary, Elizabeth. Missing from photo, Margaret and Erl. 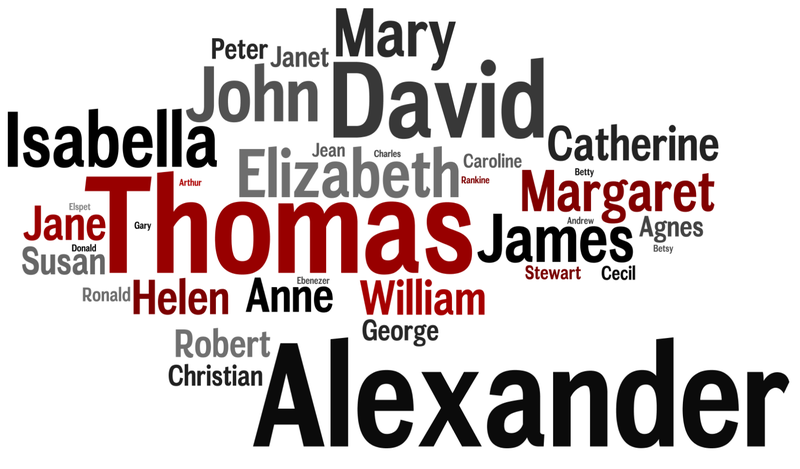 Naming my ancestors; a word cloud of all the christian names from my family tree. Once I started thinking about the importance of names as a link to the past (On names as an echo of a long-distant past), I wondered what my family naming pattern would look like. Word clouds are a great tool for this, displaying representing the frequency of any word by size. I used Wordle to generate this picture of the christian names in my family. The thing that struck me – apart from the high frequency of a small number of names (which I knew anecdotally anyway) was that although these names were common in Scotland, they are not really Scots names. Apart from a few Andrews and a Donald, most of these names could easily have come from south of the Border. 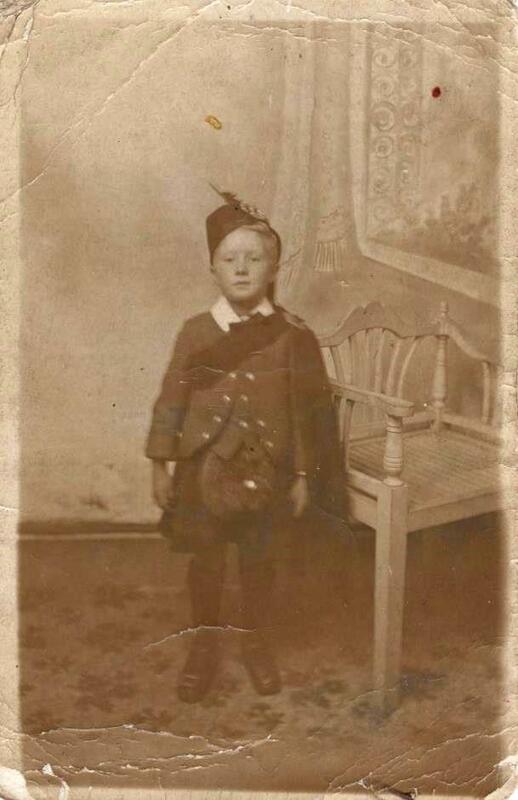 I guess what that tells me is that my ancestors -at least as far as I’ve been able to trace them – are lowland Scots, whose links to England, France and the Low Countries were probably stronger than those to their highland countrymen and women. Me and my dad’s legs; Rothesay Bay, Scotland, probably summer 1963. 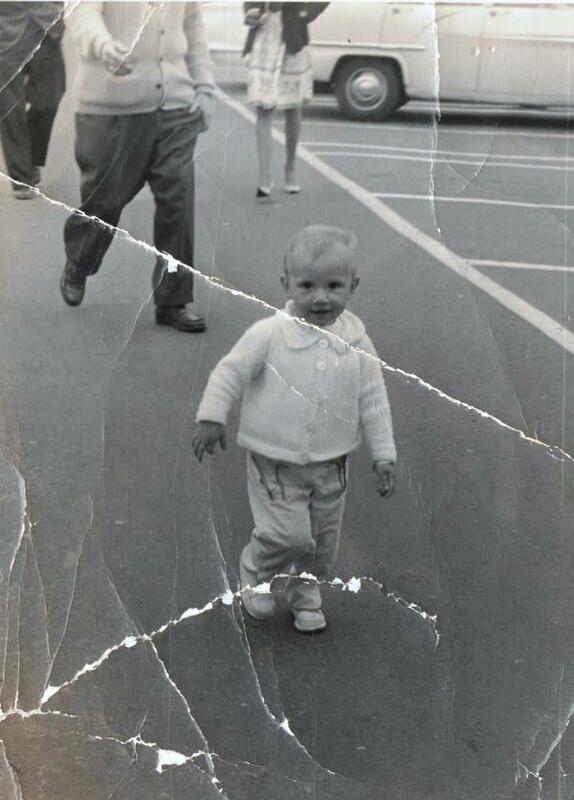 Sometime before my brother was born in 1964, my mum, dad and I went on holiday to Rothesay, on the island of Bute. I’m guessing it was in summer, probably August, and almost certainly 1963 – which means I was almost two years old. I think I have memories of that holiday – although it may be that what I “remember” is what my parents have told me. The memories are hazy – being on a boat (the ferry from Wemyss Bay? ), eating breakfast in a huge (to me) dining room with lots of other people around, and this jaunt down the pier. What I think I remember is a sense of freedom – no-one holding on to my hand or restraining me. 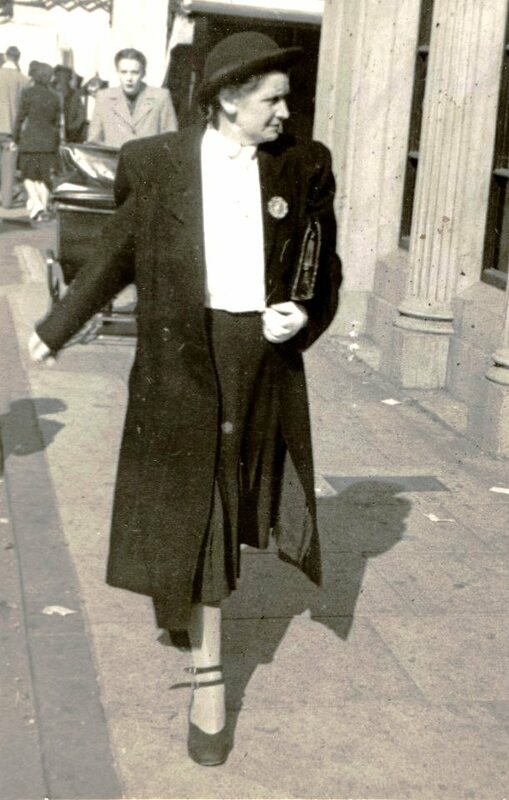 What my dad remembers is a sense of panic – I was apparently heading for the harbour. I’ve been conscious of this photo for most of my life, but it’s only when I scanned it yesterday that I noticed a name and address on the back in handwriting that belongs to neither of my parents. And that makes sense. My dad (or at least lower half) is in the photo; my mum wasn’t the family photographer – and would hardly have been idly snapping pictures while her only child toddled towards the water. Someone must have taken the picture and somehow sent it to my parents. 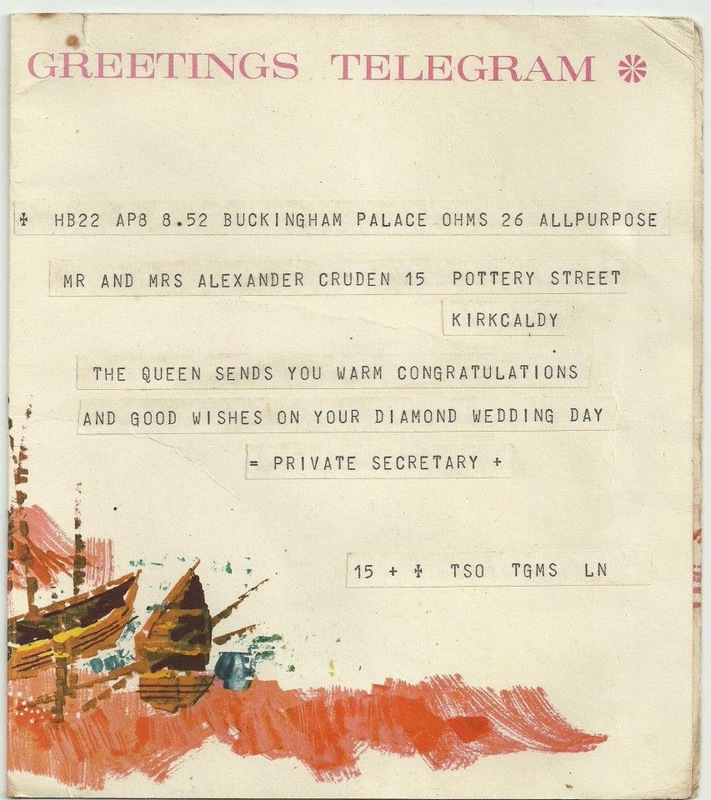 The name and address on the back is Mrs C. Galbraith, 22 Hillside Avenue, Kilmacolm. Kilmacolm is a village in Renfrewshire, about 15 miles from Wemyss Bay, from where the Rothesay ferry departed. I don’t know if Mrs Galbraith was a professional street photographer, or someone staying at the same hotel as us who had got to know my parents. Guess I’ll be asking next time I talk to Mum or Dad. This post was written both for Six Word Saturday and as part of the Word a Week Photographic Challenge: Run at A Word in Your Ear. I think all the Ramsay babies – at least in my generation – were christened in this gown. 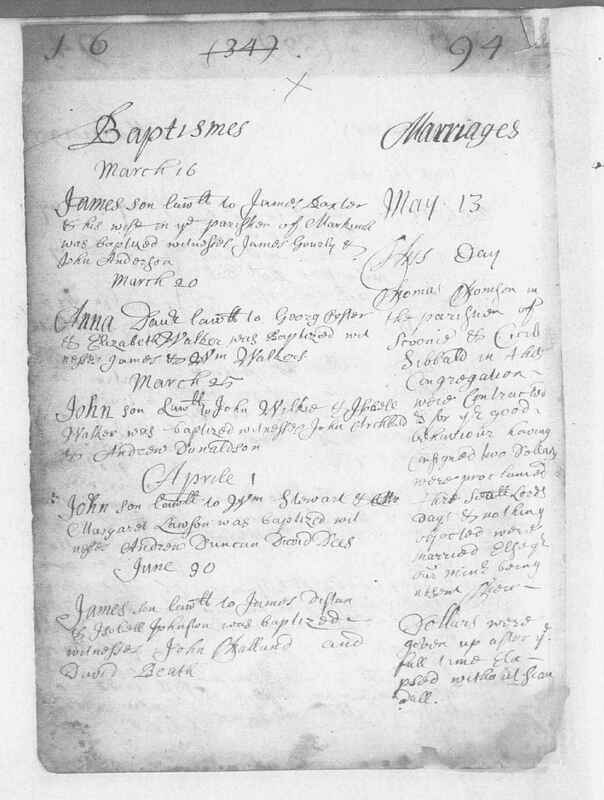 Eighteen children – and only two with the Ramsay surname.